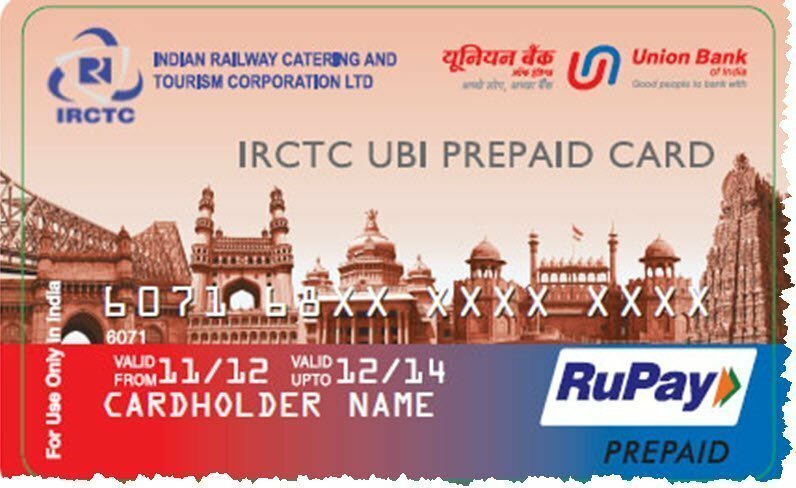 IRCTC UBI prepaid card exclusively for booking train tickets on railway IRCTC portal. Union Bank of India in collaboration with IRCTC launches its prepaid card for the customers of their bank. It is also known as IRCTC RuPay Debit Card. RuPay is India’s first payment gateway system launched by National Payments Corporation of India (NPCI). Brief information on RuPay: “RuPay” is the coinage of two terms Rupee and Payment. RuPay is specially designed for an Indian common man, banks and merchants. Almost 90% of credit card /debit card transaction cost is high due to foreign card schemes like Visa and Mastercard. The launch of the RuPay platform penetrates the duopoly of Visa and Mastercard. RuPay cards are accepted at 97% of all PoS terminals in India. Currently, most of the IRCTC customers book online tickets and make payment through debit/credit card or net banking, Making payment from RuPay card is bit different. An addition transaction charges levied on ticket booking and payment made from the debit/credit card or net banking, but if the payment made from RuPay card No such transaction charges required to pay. Book your Railway ticket from IRCTC (Indian Railway portal) online easily – (It is not a big deal). While booking your railway ticket from IRCTC UBI prepaid card, there will be no transaction charges levied for the first six months. After completion of 6 months, a nominal fee of ₹ 10 will be charged if payment made from IRCTC UBI prepaid card. IRCTC RuPay debit card holder is also eligible for Accident Insurance worth ₹ 2 lakh. For grabbing this IRCTC UBI prepaid card, it is not mandatory to have an account in Union Bank of India. You can also use this card for other payment (like online shopping, bill payments, etc. You can earn benefit like locality point earning from your card. The virtual card is valid for 1 year (required partial KYC) with the maximum limit of ₹ 10,000, after applying for this card you will get the details on your registered Email ID, this detail will be used for booking your railway ticket from IRCTC. Physical IRCTC UBI prepaid card is also valid for 1 year on partial KYC and the limit is ₹ 10,000 and if complete KYC is updated the validity is extended by 5 years, the limit extended by ₹ 50,000. The card will be delivered on your mailing address once apply. Minimum top-up is of ₹ 500 and maximum of ₹ 10,000 when partial KYC details are provided and ₹ 50, 000 when full KYC details are provided. This amount is used for booking rail tickets online.